Low carb, healthy eating and obesity - a report for the food industry on the implications of the Atkins Diet and other low carb and healthy eating market trends. Low carb is not a fad but a long term trend which is changing the face of the diet and healthy eating products market. Detailed understanding of low carb diets, low carb science and the wider influence of the low carb revolution on consumer buying behaviour is imperative for success in this new environment. 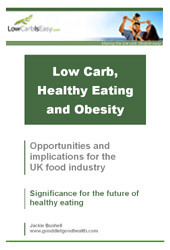 This report looks at the opportunities and threats for the UK food industry which arise from the Atkins/low carbohydrate diet phenomenon, set within the context of the many other trends and influences affecting attitudes towards diet and the health of the nation. This report will be of interest to food manufacturers, technologists, retailers, caterers and ingredient suppliers. It will also be valuable for media writers and business analysts needing an enhanced understanding of what low carbing is all about and its significance for the future of healthy eating and the UK food industry. The UK food industry is facing an era of unprecedented change. Not only is the low fat focused weight loss sector under threat from the low carb diet phenomenon, but the healthy eating credentials of the entire industry are coming under scrutiny as the Government considers measures to tackle escalating rates of obesity, diabetes and heart disease. This report explains why the industry should take the low carb phenomenon seriously. It also provides valuable insights into the threats and opportunities of the emerging low carb market, set within the context of these wider healthy eating concerns. The report considers the potential size and development of the low carb market in the UK in the light of the actual experience of the US. This is where the Atkins and most other low carb diets originated and the development of the multi-billion dollar US low carb market is already well under way. The US experience is used to highlight product areas which are likely to come under threat from the trend, and to illustrate other issues such as labelling, advertising and branding which may have adverse consequences for the unwary. The report includes detailed information on the foods and drinks that low carbers want, the likely impact of the low carb trend on existing product areas, and opportunities for new products. Information is also provided on technological developments relevant to the low carb market and on critical issues such as the use of artificial sweeteners and polyols. The need for the food advertising industry to take more proactive responsibility. 1 - Should obesity concern the food industry? Why have low carb diets become so popular? Is low carb the new healthy eating? 6 - Will the UK low carb market follow the US? The information in this report is based on published food, diet and health related press releases and media articles provided by Internet news services and industry newsletters. It also draws on insights into consumer attitudes gained from interactions with the many low carb websites and Internet forums, and the extensive personal knowledge base built up over twenty years by the author on the topics of nutrition and dieting. Jackie Bushell is a committed long term Atkins dieter, with many years' practical experience of low carb and other diets. The founder of Low Carb is Easy.com, she is also an experienced low carb cook and author of the Low Carb is Easy Interactive Cookbook, which is helping low carbers to make the change to their new way of eating all over the English-speaking world. Low Carb is Easy.com is a popular and well-respected online information and support resource about healthy eating and weight loss the low carbohydrate way. Although numerous studies have disproved the widespread belief that low carb diets are ineffective and unhealthy, much of the misinformation still exists. New and potential low carbers therefore face a morass of confusing and conflicting information. They also have to learn a whole new way of thinking in the kitchen at the same time as coping with the difficulties of shopping for low carb ingredients or eating outside the home. The objectives of Low Carb is Easy.com are to help ease these problems by providing low carbers with information, hints and tools including the unique Low Carb is Easy Interactive Cookbook, and by providing low carb information, consultancy and advertising opportunities to the food industry. 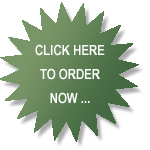 The report is an e-book which will be emailed to you in Portable Document Format (PDF). Please take a few moments to read our terms and conditions. Purchase of the report indicates that you have accepted these. You will be taken to Paypal's secure credit card payment facility where you will be able to make your purchase quickly and securely. Please note that you do not need to set up a Paypal account in order to pay. Once Paypal has notified us that your payment has been received, we will email you a link to download your copy of the report in pdf file format.